Roger N. Behle, Jr., a partner, heads the firm’s intellectual property and entertainment law departments. Roger is the former chairman of the Orange County Bar Association Intellectual Property Section and is a member of the Intellectual Property Sections of the American Bar Association and State Bar of California. Roger is also a member of the Los Angeles Copyright Society and the Federal Bar Association. 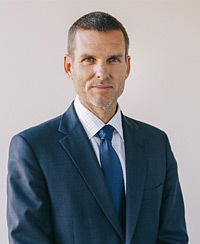 Roger brings more than twenty years’ litigation experience to the firm, and has tried multiple federal and state jury trials through verdict, including nationally publicized cases involving copyright infringement, trademark infringement, trade secrets, breach of contract, fraud and related claims. Roger has represented clients in the motion picture, television, music, art, advertising, apparel, toy and technology industries, as well as related businesses such as broadcasting, book publishing, and professional sports licensing. Roger also has extensive experience in securing intellectual property protection for clients, from clearance and registration of copyrights and trademarks, through drafting complex patent and technology license agreements. Roger has been awarded the rating of “AV – Preeminent” from Martindale-Hubble. The “AV – Preeminent” rating is a nationally recognized acknowledgment of Roger’s accomplishments and skills as an attorney and is the highest rating offered by the Martindale-Hubbell Law Directory. Roger’s practice also includes business litigation, lender liability, commercial litigation and class actions. Roger is admitted to the State Bar of California, the United States District Court, Central District of California, the United States Court of Appeals for the Ninth Circuit, the United States Court of Appeals for the Federal Circuit, and the United States Supreme Court. Roger received his undergraduate degree from the University of Utah and his law degree from Southwestern University School of Law. Contact Roger N. Behle, Jr.